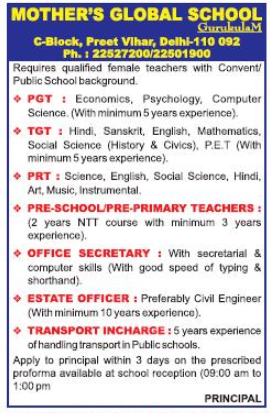 Mother's Global School, New Delhi has advertised in THE HINDUSTAN TIMES newspaper for the recruitment of TGT plus PRT plus PGT jobs vacancies. Interested and eligible job aspirants are requested to apply with in 3 days. Check out further more details below. About School: Mother’s Global School was founded by Secular Educational Society on April 10, 1984. It is a progressive, Co-ed, English medium school affiliated to CBSE. The Senior School is situated on a 2 acre plot at C-Block, Preet Vihar, Delhi just a stone throw away from the CBSE building whereas the Junior School(Pre Primary wing) is at G-block Preet Vihar on a 0.25 acre plot.